A place of contrast, the Palmilla Resort in Los Cabos, Mexico is a fiery spark in the midst of an azure tropical landscape. 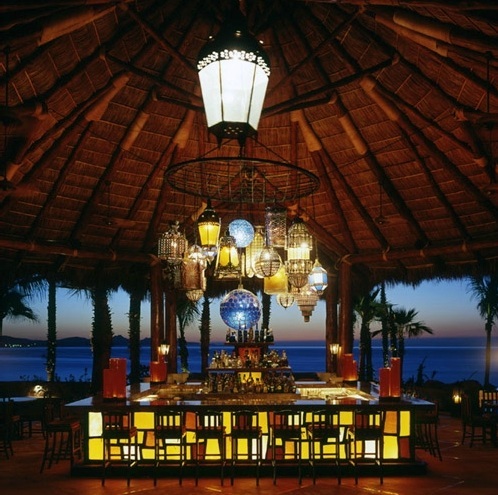 From the lavish Agua Restaurant Bar to Charlie Trotter’s famous “C” restaurant, Stromberg’s elegant architectural details perfectly compliment the resort’s décor to create a flawless vacation destination overlooking the Sea of Cortez. We’ve all heard the common expression that “location is everything,” but in the hospitality industry, you need to go the extra mile; you have to have more than everything. For that reason, Palmilla chose to expand their resort in 2005 to include fresh molding, pilasters, stained glass panels, custom trim and a kitchen canopy. However, when their local stone supplier dropped the ball, Palmilla contacted Stromberg Architectural, who immediately committed all of their resources to the project. What Do You Get the Resort That Has Everything? The Palmilla Resort in Los Cabos, Mexico is located on one of the most beautiful stretches of beach in all of Mexico. How could they possibly improve on that? This was a challenge, surely, but a challenge that Stromberg was willing to meet. When Stromberg was called in to replace the local stone supplier in Los Cabos, they immediately put their best craftsmen to work around the clock to ensure total customer satisfaction. The result? Custom trim and molding, beautiful architectural fiberglass pilasters, stained glass wall panels and a brand new kitchen canopy for the Agua Restaurant Bar. These beautiful, GFRP architectural details contribute to a totally exotic resort experience which contrasts rich colors of red, orange and yellow with the azure ocean view of the Sea of Cortez. Although the Palmilla Resort had originally wanted to use stone for this project, they ultimately decided to go with architectural fiberglass. However, this decision wasn’t a compromise; it was the result of product research and fiscal wisdom. Architectural fiberglass, or GFRP, offers various improvements on traditional building materials like stone, least of all convenience. Architectural fiberglass is also weather-resistant, water-resistant, easy to clean and maintain, and less likely to chip, scuff or crack than stone or concrete. In fact, Stromberg GFRP has even been known to stand up to hurricanes that demolished everything else, making architectural fiberglass the material of choice for building in high risk areas like the Gulf Coast. Add to that the fact that GFRP is less expensive than traditional building materials, and it is light-weight and easy to install. Put those numbers into your calculator, and it’ll make a happy face. While Stromberg offers a wide variety of per-designed products, they also offer the opportunity to work with one of their expert craftsmen to custom-design a product for your project. Whether you need custom molding and trim like the Palmilla Resort, or something more extravagant like columns, sculpture or just about anything else you could dream up, don’t compromise! Call Stromberg, and design the perfect architectural details for your project. Miami, FL architectural fiberglass, architectural fiberglass in New Orleans, LA, architectural fiberglass in Los Cabos, Mexico architectural fiberglass in the Bahamas, Florida Keys architectural fiberglass, Los Angeles, CA architectural fiberglass, architectural fiberglass in Galveston, TX and more.